Robbie MacLeod converted a last-minute penalty following a red card for Newtonmore goalkeeper Owen Fraser to earn Kyles Athletic a 2-2 draw at home to the champions. Kingussie top the Premiership table after coming from behind to defeat Kinlochshiel 2-1 at The Dell, just four months after a relegation play-off to survive in the top flight. The seasons of two of the major cup winners of 2015 sparked into life when Glenurquhart bit back for a 3-1 home success against Fort William, while Greg Matheson scored a hat-trick as Lovat swept Lochaber aside 5-1 in Kiltarlity. Oban Camanachd equalised late to grab a 2-2 draw on Skye. Thomas Whyte opened the scoring for Kyles midway through the first half but by half time Newtonmore were in front thanks to Evan Menzies and Chris Sellar. And there it stayed until Fraser's dismissal and MacLeod's last gasp equaliser. However, Kingussie, who avoided an opening day postponement so have played one more game, maintained their unbeaten record despite Keith MacRae giving Kinlochshiel a first-half lead. Thomas Borthwick equalised with a penalty and then got the winner with 17 minutes remaining. This leaves Kingussie top with five points from three games while Newtonmore and Kyles both have three from two. 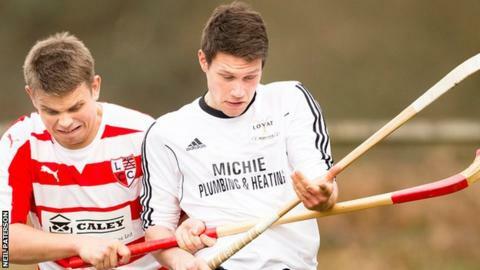 Camanachd Cup holders Lovat got their first league points with a decisive eclipse of Lochaber. Matheson's treble, which he rounded off with a penalty, began in the second minute. Kevin Bartlett also got one in each half while Lochaber's only response was a Stuart Callison penalty which briefly had the score at 4-1. Glenurquhart, will be glad to see the end of a wretched start to the season before they open their defence of the MacTavish Cup. However, it didn't start well against Fort whose Bryan Simpson got the opener early in the second half. But Fraser Heath soon equalised, Neale Reid put Glen ahead and Cairn Urquhart put it in the bag for them late on. Willie Neilson got a first minute breakthrough for Oban Camanachd on Skye but a goal in each half from Jordan Murchison, on whom the island side's progress on their Premiership return will depend heavily, had the hosts 2-1 up by 73 minutes. Cameron's late strike for Camanachd then tied it up. There was better news for newly relegated Inveraray in the National Division when they recorded their first win of the season, 3-1 over Inverness at The Winterton. Newly-promoted Bute had an encouraging 1-1 draw away to title favourites Kilmallie, while Glasgow Mid Argyll got their noses in front early en route to a 3-2 success at Beauly. Ballachullish and Caberfeidh fought out a 2-2 draw at Jubilee Park.